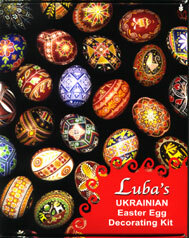 Egg decorating kits for making Pysanky (Ukrainian Easter eggs), for beginners and everyone. All these kits include the special tools needed to create and design Pysanky, and some offer savings over purchasing each item individually. Other basic items needed, such as eggs, distilled water, white vinegar, wide-mouth jars, candles, and matches, are all readily available in your grocery or discount stores. (For more information on the tools needed, visit our ONLINE PYSANKY Tutorial ). All Economy Kits contain : 1 Medium Economy Kiska KE02, 1 half circle 0.7 ounce Natural Beeswax WAX10 , Cleaning Wire and 6 dyes. Instructions or box are not included. The economy kits are for those individuals wanting to get the lowest price for a basic kit and already have access to designs and instructions, such as those available on the web. If you need more help, browse our Design books. KIT2D is a great beginner's basic kit for making Pysanky. It has all the special tools to take that first step, including a more heat resistant delrin kistka. 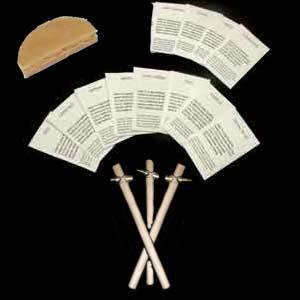 Basic instructions are included in the kit, but if you need more help, browse our Design books. 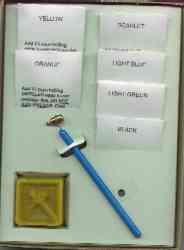 This economy kit is for those individuals wanting to get the lowest price for a deluxe style kit. 12 dyes provide ample color combinations and the 3 sizes of kistky gives you the tools needed to tackle most designs. No instructions provided, therefore this kit is for those pysanky artists that already have access to designs and instructions, such as those available on the web. If you need more help, browse our Design Books. KITSD has all three sizes of delrin kistky, more dyes and a few more designs than the beginner's kit. Designed for the individual who wants to learn more than simply the basics and perfect the craft. A color instruction pamphlet is included in the kit, but if you want more inspiration, browse our Design books. KITSD16 kit is the same as the KITSD, except it includes four additional dye colors (for a total of 16 dyes), and offers savings over purchasing the items individually. A color instruction pamphlet is included in the kit, but browse our Design books for ideas. 5 Additional dyes to complete the set! 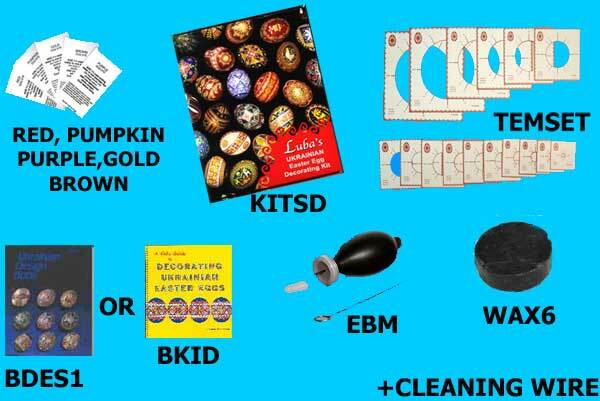 From beginner to more advanced levels, the Ultimate Kit Combo is a complete 'goody bag' of tools for learning to make Pysanky or perfecting your skills. 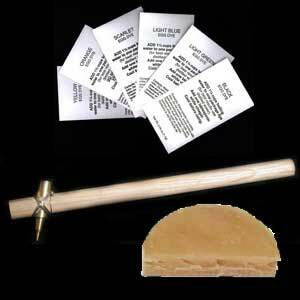 Both kits contain every color dye that we offer, a set of our delrin kistky, 1 block of natural beeswax, a large block of blackened beeswax, an egg blower, template set, cleaning wire and your choice of a beginner or advanced beginner book. Either kit offers to you savings over purchasing the items individually. Interesting Fact: The word pysanka (pronounced py-sahn-kah) originates from the Ukrainian word, pysaty, which means 'to write.' Traditionally like iconography, someone does not paint or decorate a pysanka, but rather 'writes' the pysanka. The singular is pysanka; the plural is pysanky.